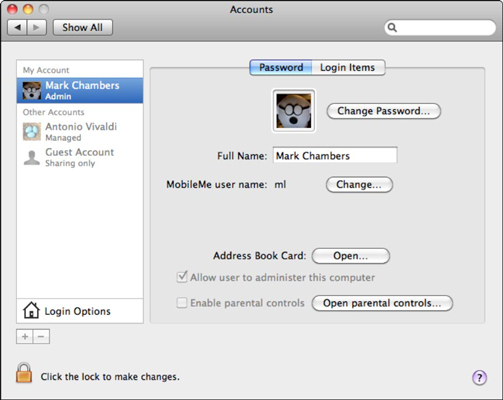 Mac’s System Preferences pane, which you access by clicking the gear icon on the Dock, lets you manage your Accounts. Each user on your system has an entry in the Accounts list. The panes and settings here change, depending on the access level of the selected account. Configuring accounts is easy from System Preferences. Password pane: Click in these text fields to enter or edit the account name, password, and password hint for the selected user. Click the Address Book Card Open button to edit the card that you mark in the Address Book as My Card. Mac OS X launches the Address Book, and you can edit your card to your heart’s content. You can set a different MobileMe account name and password for each user account from this pane as well. If you’re sharing your Mac with other users, each person can set up his or her own MobileMe account! If you have administrator access, you can enable Parental Controls for the selected user account or open the Parental Controls pane. Picture well: From the Picture well — the square area to the right of the Account list — you can choose one of the thumbnail images provided by Apple to represent you, or drag a photo in from iPhoto. Click the well to display the thumbnails. Click Edit Picture to drag a new image from the Finder or take a video snapshot using your Mac’s iSight camera. To remove an application from the list, click to select it and then click the Remove button (which has a minus sign). Each application can be launched in a hidden state, meaning its window doesn’t appear on the Desktop. To toggle an item as hidden or visible, enable the Hide check box next to the desired application. Change the launch order of Login Items by dragging entries in the list into the desired sequence. Note that a user must be logged in to view and change the items on the Login Items. You can even set up Login Items directly from the Dock! Control-click (or right-click) the desired Dock icon to display the pop-up menu and then click Open at Login. You can also add VoiceOver spoken interface support at the Login screen, making it easier for physically challenged users to log in to this Mac. The Login Options panel also allows you to enable or disable Fast User Switching, and you can prevent anyone from restarting or shutting down the Mac from the Login screen by selecting the Hide the Restart and Shut Down Buttons check box.